Join us for the monthly Carpe Diem-Washington Revels Family & Community Sing. This month we celebrate the arrival of Spring, as well as Irish Heritage Month, Women’s History Month and National Reading Month! DATE/TIME: Thursday, March 21, 2019, 6:30-8:30 pm. 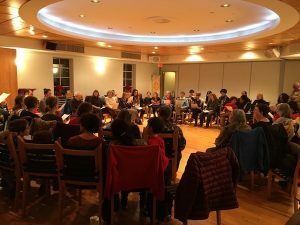 We gather on the 21st of every month — join us on April 21 for our next Sing!